Place the chicken thighs in the base of the slow cooker. 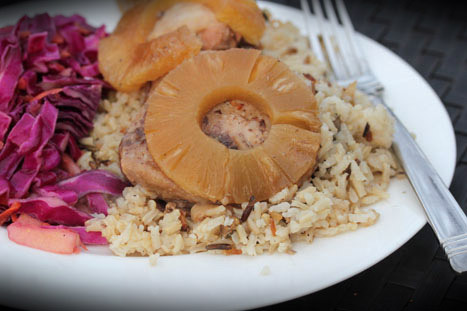 Top with the the pineapple slices and add some of the juice from the can into the slow cooker. Sprinkle the cinnamon and crushed red pepper over top. Before dinner, cook the rice as directed on the package. Serve with side of vegetables. Any will do! I finally figured out how to make a frugal lasagna: replace the expensive cheeses that my kids don’t like with mozzarella which they do like. Making a lasagna with taco seasonings and salsa also allowed me to replace 1/2 of the meat with black beans, further reducing the cost. Alea-what a wonderful idea! I love lasagna but my husband and children do not like cheese. So I rarely get to make it. But we all love tacos-that is such a great idea! Thank you!! Thanks for the link up. And Congrats on your new site. Love slow cooker recipes! Thanks! Love the slow cooker! Bone in chicken works so great. See the Garlic Lime chicken recipe…it is awesome and SOOOO easy! Mine is more like a $5 lunch or snack…. well.. less than $5, but we eat it for Breakfast, lunch or dinner (sometimes)! I made this today, and I wasn’t impressed with it 🙁 The dish seemed to lack flavour — the crushed red pepper got absorbed by the pineapple and didn’t flavour the chicken 🙁 Will try to tweak this though! I made this today with a few simple tweaks that I thought worked really well. We used a little extra pineapple (the can had 10 slices) and all of the juice from the can. When I was almost ready to make the rice, I mixed some olive oil and garlic with about 1/2 cup of pineapple juice and 2 cut up and “mushed” pineapple slices out of the slow cooker. Then I added a little bit of chicken bouillon (which worked well as there wasn’t a lot of salt in anything else we were using). I used that concoction mixed with water to cook the rice in. Yum! I made this last night and it was really tasty! Even my husband who, as a rule, doesn’t like cooked pineapple took seconds! I made a small modification (as did someone above) in that I added all of the pineapple (10 slices) and juice from the can. I think I let it go a little longer than 8 hours (busy day!) and it was touch dry – but next time I’ll probably just add 1/2 to 1 cup chicken stock which I think would solve the problem. Wonderful Carissa! And adding some stock, or even water would help with the dryness.